My only evening in Brussels was well invested in a hearty dinner with lots of wine, ribs and nice company. We visited a Christmas market where one could buy all sorts of expensive holiday paraphernalia and drink enough hot wine to not care anymore about their prices. The trip from my hostel bed in Brussels to my sister's apartment in Montpellier was uneventful (other than the loss of my little gray hat). I was picked up by Bea at the bus station and promptly taken home for a quick lunch and a long shower. Bea had to go to her university for an exam, so I was left behind for some city exploration. I walked to the city center, which holds some sort of similarity that I can't really define with other Mediterranean cities like Cagliari in Sardinia or Split in Croatia. I did some extensive window shopping and then strolled through the Christmas market, which had the same gorgeous little presents at the same unreasonable prices as in Belgium. Bea and I met in the city center after her exam and strolled around the streets in Montpellier, talking and people watching. We decided to stop in a burger place to get food with rock n' roll names and meet up with Bea's boyfriend. I got an Unforgetable burger, with honey and goat cheese, but seriously considered having a Highway to hell which had bacon inside and didn't look half bad. 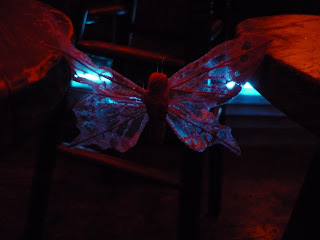 And then, while we were in the queue to order our burgers, we met three charming Montpellierians: Jeanne Michemouche, a pretty pink paper butterfly with sparkly wings, and Sarah and Victor, two slightly drunk and very entertaining students. As they recounted, their friendship with Jeanne had been short but very intense as they had picked her up from the garbage only minutes before, saving her from humiliation and a certain death. We were touched by their story and couldn't refuse an invitation to join them for a beer on the chilly terrace of a bar. We were caught in the rain but insisted on staying in place by pulling out a children-sized umbrella to protect our food and beers. We went to another bar for a drink and to dance some reggae and salsa. We decided to go for one last drink before the shutdown of Montpellier's public transportation system at one in the morning, and enjoyed some sangrias on the terrace of another bar. Before parting, we exchanged phone numbers, Facebook profiles and good wishes, while giving Jeanne Michemouche a Mexican name, Juana Michimucha. I'm not really sure what there is to see or do in Montpellier and for that reason, can't really recommend it to anyone. But if you're ever in Montpellier and bump into a pretty pink paper butterfly with sparkly wings, please send some greetings on my behalf as I've been unable so far to find Jeanne Michemouche on Facebook. Maybe she's adopted her Mexican alias and gone somewhere else for the winter..